As I did not think of comparing fresh hoped beer until someone gave me the idea on twitter recently I will only be comparing two fresh hoped IPA this year. The two beer being compared are as follows: Driftwood Brewing – Sartori harvest IPA and the Phillips Brewing – Green Reaper Fresh Hop IPA both out of Victoria BC. These beer were tested one after the other while taking notes by Carmen and I. 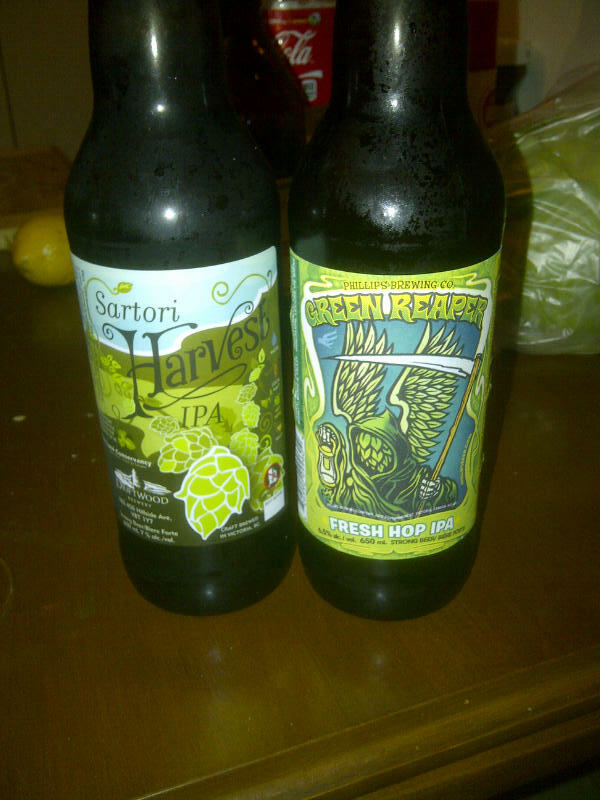 We started by pouring the Sartori Harvest followed by the Green Reaper. Both beer had a very similar appearance with both the colour of the beer and the head. Both beer poured with a very similar sized head with some obvious carbonation. Both beer had distinct aromas unlike regular IPA’s. The Sartori Harvest had aromas of very floral hops, pine, resin, citrus and tropical fruits while the Green Reaper had aromas of floral/herbal hops and some grapefruit. The Sartori Harvest’s aroma just had more fullness and character and really stood out. Again unlike regular IPA’s these beer had a very distinct flavour that comes from using fresh hops. The Sartori harvest possessed the flavour of pine, resin, citrus, pepper with some earthy tones and a hop forward bitterness. 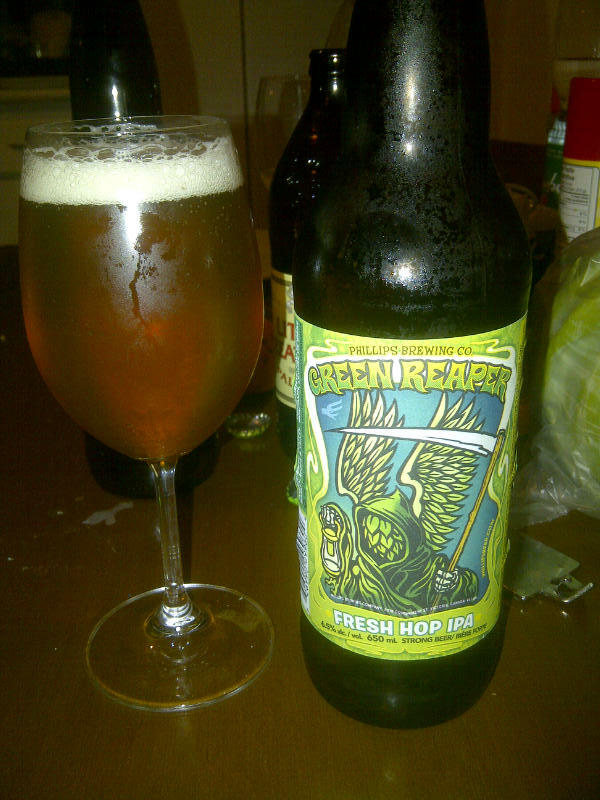 The Green Reaper’s flavour was very hop forward with some pine and mild citrus. The Green Reaper had a very nice flavour with it was just not as complex or pleasing as the Sartori Harvest. These two beer used very different hops varieties. The Sartori harvest uses fresh Centennial Hops which gives off floral and citrus characteristics with a medium to high bitterness. The Green Reaper on the other hand uses a fresh Willamette hops called by some the king of aroma hops in the United States which displays floral, fruity, earth and spice characteristics with a modest bittering. Taking these descriptions into account I would say that the Sartori Harvest’s hops shows all the characteristics of Centennial Hops with a good bittering at 75 IBU, while the Green Reaper has a really strong bittering from the hops while the aroma is lacking the Willamette’s strong aroma characteristics. 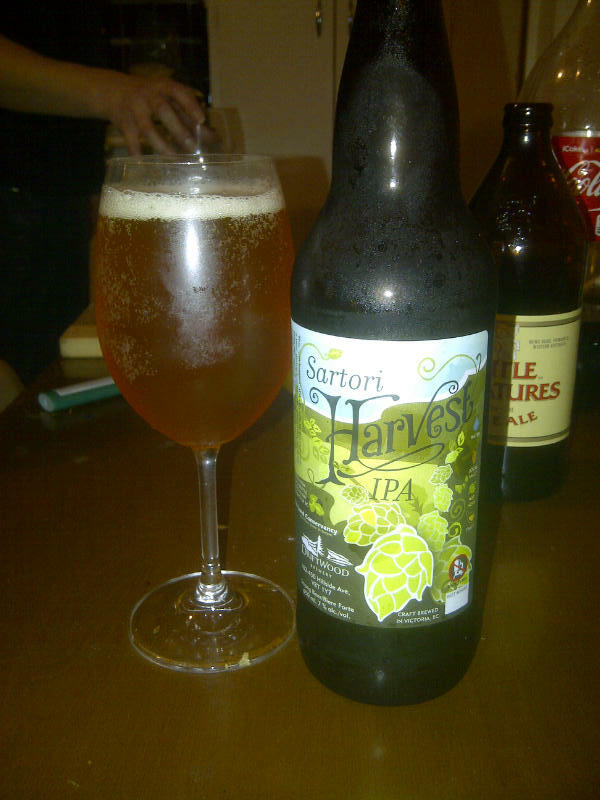 Based soly on the what the hops should bring to the table I would say Sartori Harvest delivers on the promise. Even though we picked the Sartori Harvest IPA to be the winner the Green Reaper Wet Hop IPA was a very good brew! I would not hesitate to pick up either of these beer next year if they both come back again. I hope to next year stockpile wet hoped IPA and Pale Ales and do a challenge again. This entry was posted in India Pale Ale and tagged 2012, bc, canada, challange, driftwood brewing, green reaper, IPA, phillips brewing, sartori harvest, victoria, wet hoped. I also agree, did you try the Hoyne Wolf Vine? Of the three, I think it might be the best, but that’s just me. I did try wolf vine but I did not have any left at the time of this test so it did not count. I still think Sartori was best but they were all great!